If there was any doubt before, there should be no doubt now, the economy, led by the service sector is now in recession. The US service sector contracted in January. The Institute for Supply Management reported that its index of service sector business activity declined to 44.6 in January from a revised reading of 54.4 in December. Economists surveyed by Thomson Financial/IFR had expected a slight slowdown but had still forecast growth, with a median estimate for the index of 53. A reading above 50 indicates expansion, while below 50 indicates contraction. It was the first time the service sector reading has contracted since March 2003. "This is an absolute collapse of this index," said Nigel Gault, chief U.S. economist at Global Insight. 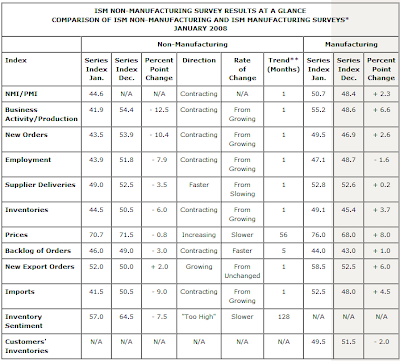 ISM said only three service industries reported growth, while 14 showed contraction. The three growing segments — utilities, professional services and educational services — include more crucial needs such as doctor visits. Meanwhile, cutbacks in less-essential spending has dragged down such segments as arts and entertainment, fishing and hunting, and lodging and food services. Two measures that fell were those for new orders and employment, which Nieves said were more forward-looking — so their drops could indicate trouble ahead. New orders fell to 43.5 while employment fell to 43.9. Reuters is reporting Services contract in US, fading fast in euro zone. "An absolutely stunning ISM non-manufacturing number leaves the chart of the index looking like it has fallen off the edge of a cliff, and is heartwarming only for those who think the economy is already in a recession," said Alan Ruskin, strategist at RBS Greenwich. "It seems clear that the economy has slowed in recent months: however, we will need to see much more in the way of supporting evidence before we believe that growth has slowed as much as this series suggests," said Drew Matus, economist at Lehman Brothers in New York. My Comment: More supporting evidence is needed? The holiday shopping season was miserable. More importantly, Jobs Contracted in 2007 as Job Growth Revised Away. How much more supporting evidence does one need? Is Matus reporting from Pluto? The data followed news earlier on Tuesday that euro zone services growth slowed to a near halt in January from an already weak early estimate, with services in three of the bloc's four biggest economies -- Germany, Italy and Spain -- contracting. Of the big four only France showed growth. The RBS/NTC Euro zone Services Purchasing Managers Index fell a sharp 1.4 points to 50.6 in January from an earlier flash estimate of 52.0. That index is now dangerously close to the 50 mark that divides growth from contraction. Those data marked a new four-and-a-half year low for services in the 15-member bloc and also came in well below the 52.0 consensus -- although by nowhere near a big a gap as the U.S. numbers. "Euro zone growth is in trouble and the risk of recession at some stage should not be underplayed. Business confidence is sliding and consumer morale is being hit hard," said David Brown, chief European economist at Bear Stearns, before the U.S. ISM report was released. The EuroZone Decoupling Theory is now officially dead. The only question now is how big the recession in Europe will be. The US is in recession and it is going to be nasty. Professor Depew was talking about the ISM in point number 1 of Five Things: Everybody, Back Into the Woods! Back Into the Woods! There was very little about this morning's release of the Institute for Supply Management's Non-Manufacturing Index that wasn't a fiasco. First, the report was released about an hour early "due to a possible breach of information." Second, the plunge in the index headline composite index number, from 53.9 to 44.6 stunned even the most grim-faced bears. Third, a recently announced change in the composition of the index mistakenly led a few "We're Out of the Woods" optimists to conclude that perhaps the numbers aren't' as bad as they seem. Well, everyone can run back into the woods, because they are as bad as they seem. All that was revised was the weighted formula for the overall headline composite index number. The previous weighted formula was scrapped in favor of an equal-weighted formula because, according to the ISM, to more closely predict GDP. What does that gibberish mean? In the old formula these were weighted unequally. Now, they are weighted equally at 25% each. So while the overall composite reading of 44.6 may not compare easily to the January weighted composite of 53.9, the measurements of the components themselves are unchanged, and the component index readings are most important. Therefore, when one sees the Business Activity Index plunge from 54.4 to 41.9 or the New Orders Index decline from 53.9 to 43.5, the Employment Index slip from 51.8 to 43.9 and the Supplier Deliveries Index fall from 52.5 to 49, the weakness is apparent. remember, any reading below 50 signals contraction. Bottom Line: Service industries make up more than three-quarters of the economy. This is a very weak report. Some of the internals are at 2001 levels reached during post-9/11 stress and ahead of the 2002 deflationary scare. Everyone out of the woods should now run back into the woods for cover. Bernanke needs a Crash Course On Economics. The global economy is fading fast.